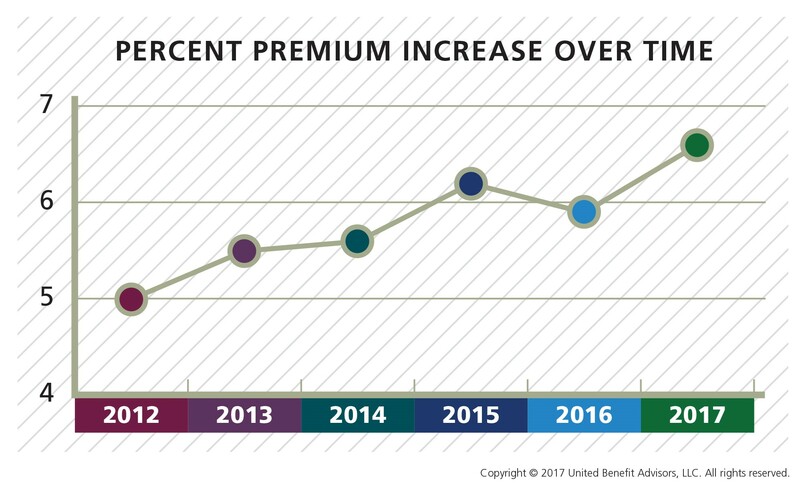 Premium renewal rates (the comparison of similar plan rates year over year) for employer sponsored health insurance rose an average of 6.6%—a significant increase from the five-year average increase of 5.6%, according to the 2017 United Benefit Advisors (UBA) Health Plan Survey, released today. Two states saw record premium increases: Connecticut saw a 24% increase in premiums in 2017, up to $655 from $530; New York also saw a large increase of 14%, up to $712 in 2017 over $624 in 2016. On the other side, some states saw decreases in premiums, such as Arizona and Washington which saw 2% and 10% decreases, respectively. Average employee premiums for all employer-sponsored plans rose from $509 in 2016 for single coverage to $532 in 2017 and from $1,236 to $1,272 for family coverage (a 4.5% and 3% increase respectively). Average annual total costs per employee increased from $9,727 to $9,935. However, the employee share of total costs rose 5% from $3,378 to $3,550, while the employer’s share rose less than 1%, from $6,350 to $6,401. Prescription Drug Plans—For a second year, prescription drug plans with four or more tiers are exceeding the number of plans with one to three tiers. Almost three-quarters (72.6%) of prescription drug plans have four or more tiers, while 27.4% have three or fewer tiers. Even more surprising is that the number of six-tier plans has surged, accounting for 32% of all plans, when only 2% of plans were using this design only a year ago. “While employers chose to hold contributions, copays and in-network benefits steady, they dramatically shifted prescription drug costs to employees. By increasing tiering and adding coinsurance (vs. copays), employers were able to contain costs,” says Weber. Out-of-Pocket Costs—Median in-network deductibles for singles and families across all plans remain steady at $2,000 and $4,000, respectively. Single out-of-network median deductibles saw a 13% increase in 2016, and a 17.6% increase in 2017, from $3,400 to $4,000. Both singles and families are facing continued increases in median in-network out-of-pocket maximums (up by $560 and $1,000, respectively, to $5,000 and $10,000). Self-Funding—The number of employers using self-funding grew 48% for employers with 25 to 49 employees in 2017 (5.8% of plans), and 13.4% for employers with 50 to 99 employees (9.3% of plans). Overall, 12.8% of all plans are self-funded, up from 12.5% in 2016, while almost two-thirds (60.9%) of all large employer (1,000+ employees) plans are self-funded. The 2017 UBA Health Plan Survey Executive Summary is available now at http://bit.ly/2017UBASurvey. For interviews, contact Carina Sammartino, Media Relations, csammartino (at) hrmarketer.com or 760-331-3547. The 2017 UBA Health Plan Survey contains the validated responses of 20,099 health plans and 11,221 employers, who cumulatively employ over two and a half million employees and insure more than five million total lives. While other surveys primarily target large employers, the focus of the UBA survey is to report results that are applicable to the small and mid-size companies that represent the overwhelming majority of the nation’s employers, while also including a mix of large companies in rough proportion to their actual prevalence, nationally. This is an important distinction compared to other national surveys.